Mesmerising digital watercolour tools heighten the appeal of this increasingly useful natural media package. With controls that accurately replicate the behaviour of traditional art materials, Rebelle leads the way when it comes to 'natural media'. Can digital painting ever feel as natural as working in traditional media? 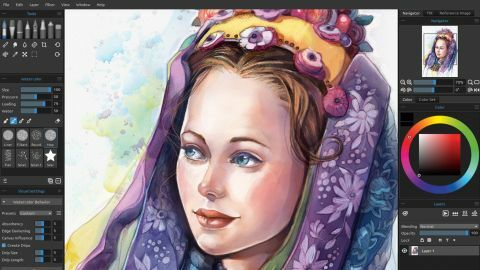 We’re not there yet, but there’s an army of software developers dedicated to achieving the look and feel of traditional painting techniques. Painter and ArtRage are the best-known programs to offer ‘natural media’, a digital recreation of physical paints and surfaces, but Rebelle is an enticing alternative – and, in this third major release, seems capable of producing a few tricks the big guns can’t yet match. Rebelle offers a choice of media to draw or paint with: acrylic, pastel, pencil, ink and more – although not oils. But its biggest draw is its watercolour technology, which has been significantly updated in version 3. Make a stroke with one colour, then switch colour and paint over or near the first stroke, then watch as the two strokes blend and flow together in a convincingly natural way. You can also load the brush with water to increase the extent of the interaction. If you’re using Rebelle 3 on Microsoft’s Surface Pro tablet computer, you can use the device’s built-in accelerometer to control the flow of paint: try physically tipping the tablet screen in one direction, and watch the watercolour droplets respond to the effect of gravity, as fed back to the software through the accelerometer. It’s something close to magic. And unlike physical watercolour, you can ‘freeze’ the paint movement with a single key press. Rebelle’s selection of digital paper surfaces can also affect the path and behaviour of the watercolour paint, depending on how rough the grain is. If there’s a drawback, it’s that you have to find the best brush settings yourself, through trial and error: there are only a few brush presets to choose between until you’ve taken the time to make your own. At least that task is made easier in Rebelle 3 with the Brush Creator. You can import graphics to represent brush shapes or grain, making some truly fanciful creations a possibility, then play with Spacing, Opacity and Jitter before saving the result as a permanent preset. That isn’t the only trick up Rebelle 3’s sleeve: you can now paint with masking fluid on its own layer, which gives you more control over how the mask affects the flow of paint. Elsewhere, new additions include a Magic Wand tool, and canvas size that’s only limited by your computer memory’s ability to accommodate it. More technically minded artists will appreciate the options to use a ruler or set up a perspective grid, and to have a reference image displayed in an on-screen overlay. There’s still plenty of untapped potential for Rebelle’s developers to explore in future releases – more presets and more paint media come to mind – but the effectiveness of the watercolours alone is enough to make this affordable software worth adding to your creative toolbox. This article was originally published in issue 164of ImagineFX. Read more: The best software for digital artists.